Von Linsing's grenadier battalion was one of three brigaded under Colonel Karl von Donop. The brigade was present at Long Island, White Plans, Brandywine, Germantown, Fort Mercer/Redbank, Monmouth and Charleston. When Von Donop was mortally wounded at the battle of Fort Mercer command of the brigade passed to Colonel Kospoth. The battalion recorded the highest number of casualties of all the Hessian units - 169 killed and wounded. The assault on Fort Mercer in October 1777 (sometimes referred to as the battle of Red Bank) was a disaster for the Hessian corps. With their reputation badly damaged by Trenton, the Hessian commanders were keen to redeem themselves and show that their troops (and themselves) could make a positive contribution to the fighting. Von Donop in particular smarted from the Hessian surrender at Trenton as the troops stationed there formed part of his command. Fort Mercer was sited on the New Jersey side of the Delaware and it's destruction (together with other forts along the river) was essential to keep the Delaware open for the supply of the British army in Philadelphia. Von Donop volunteered to make the attack. The disaster that followed seems to have flowed from a mix of (1) bad intelligence, which mistakenly suggested that the fort was incomplete, (2) confusion as to the Hessians' orders, with von Donop thinking he had to assault the position at all costs and Howe assuming that the attack would cease if the defences were found to be too strong, and (3) canny fortification work by the Americans under the direction of French engineers. The assault came under heavy fire from both the defenders of the fort and ships moored in the Delaware and collapsed. Von Donop suffered a shattered hip and died 3 days later. Despite its failure, the battle illustrated the exceptional courage that the best Hessian troops could show, with both American and British soldiers remarking on the courage displayed in the attack, particularly by the officers. 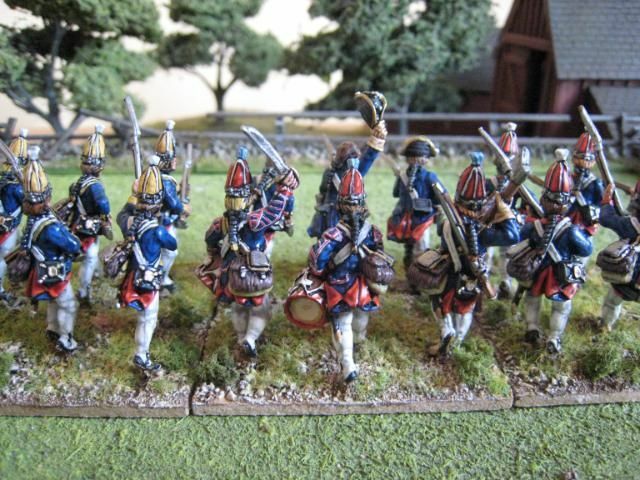 I was surprised to see that I haven't painted any Hessians since September 2008, but I'm now trying to plug some of the gaps and the von Mirbach musketeers are close to being finished. Von Linsing's regiment comprised the grenadier companies from the 2nd and 3rd Guard Regiments, the Leib Regiment and von Mirbach Regiment. 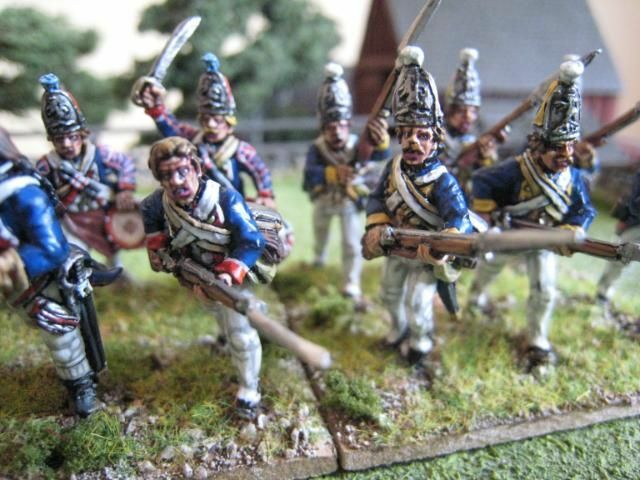 For my 18-figure recreation, I just painted 3 regiments' worth - the 2nd Grenadiers on the left, von Mirbach in the middle and Leib on the right. 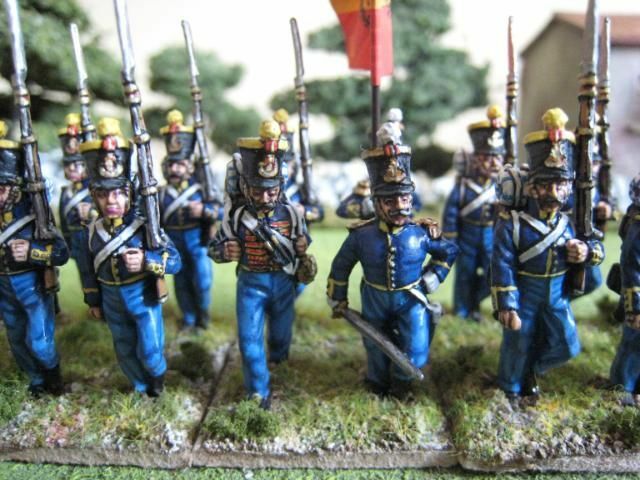 I'm not sure why I chose von Mirbach for the command stand, given that I'm painting the rest of the regiment now, and I should also point out a couple of mistakes: the officers should have silver lace on the facings and hat, not white and gold respectively and the drum rims should be white over red, not the other way around. Silly me. On the Von Donop.org site, the Guard Regiments' uniforms look as if they have tassles on the button-hole lace. I tried to give a suggestion of this by adding white lace on the buttons in between the coat facings and turnbacks, but I saw no need to paint anything more elaborate than that. 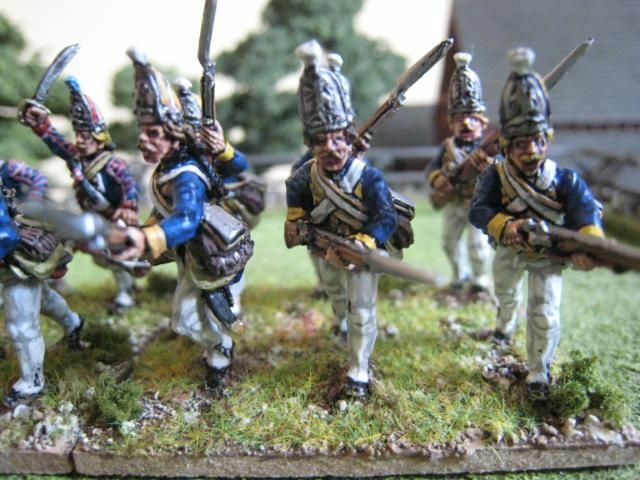 For the published "British Grenadier" scenarios you need 18 figures for Long Island and Monmouth and 20 figures for Brandywine. I decided to go with 18, on the basis that I can always pretend it has 20 figures if I find myself doing Brandywine again. 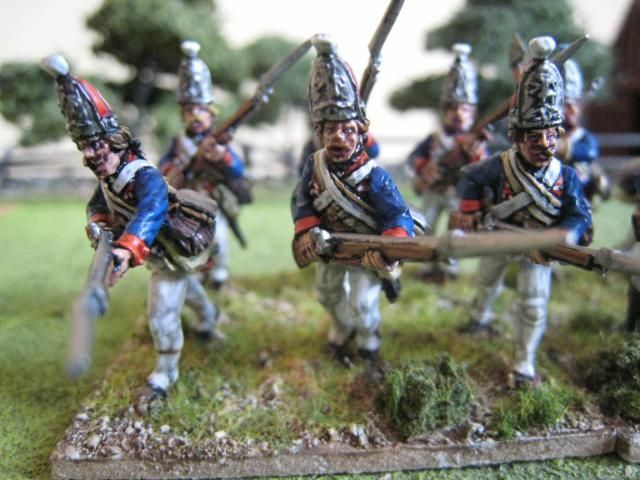 I'm still some way away from being able to field a full Hessian grenadier brigade (as far as I'm aware, only the great Eclaireur himself is able to do that), but I'm inching closer...I've been a bit slow at posting the past few days. 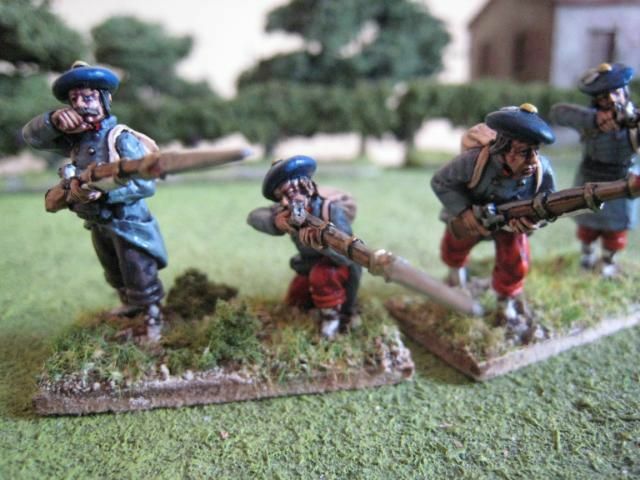 More Carlists on Sunday and more AWI next week. 18 figures. Painted December 2009. 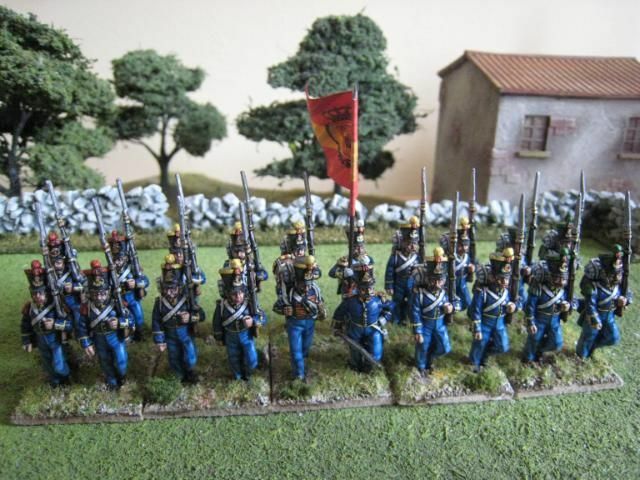 These are my first figures for the Carlist side of the FCW. I wanted to do some skirmishers to try out colours for the greatcoats, as most of the figures who fought for Don Carlos will be dressed in greatcoats. Carlist infantry largely consisted of battalions of recruits from specific provinces - Navarre, Alava, Guipuzcoa etc. 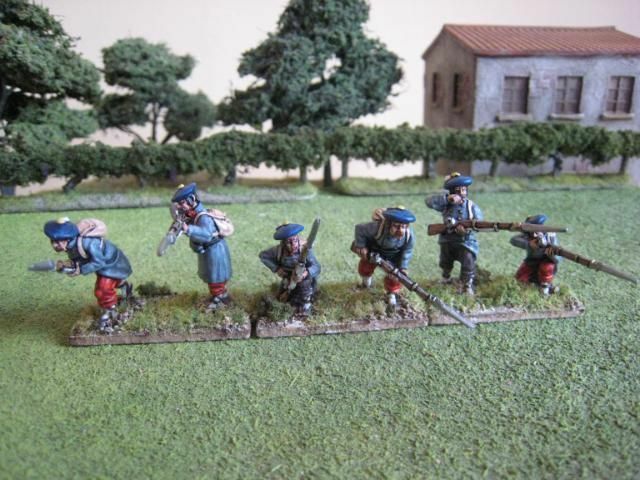 These figures are painted as a Navarre unit - grey greatcoats, red trousers and dark blue berets. 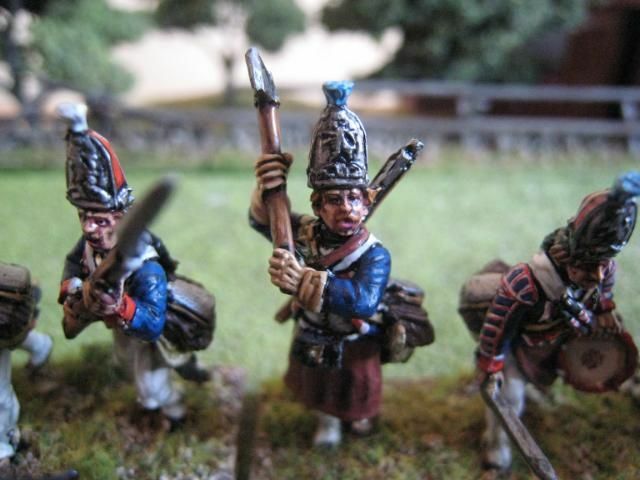 The greatcoats were painted with the Foundry "German Late Field Grey 78". 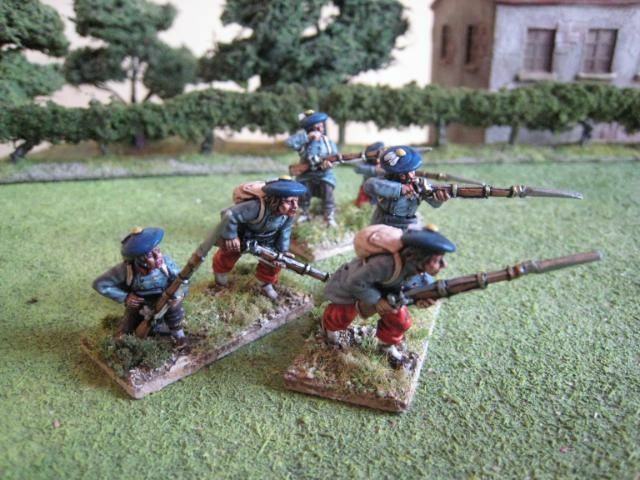 As the majority of Carlists I paint are going to be in greatcoats, I wanted colours that I could use straight out of the pot and which were a different hue to the colours I use on the Isabelinos' greatcoats (Foundry "Slate Grey 32"). I've had difficulties locating decent grey paints for layering, but the German grey colours give quite a nice look that is quite different to the Isabelinos. I painted these figures "straight", without any weathering or mud effects. I imagine that the regulation red trousers were hard to come by, so gave a couple of figures some dark brown ones. 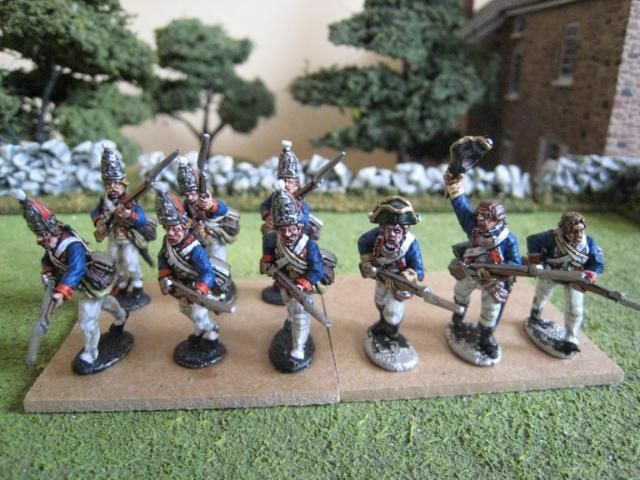 I will add more skirmishers in the future - I just wanted to paint these up as test figures before starting a full Carlist battalion. With painting time at a premium nowadays, I am rediscovering the joys of figures in greatcoats! The building in the background is from Tablescape, the vines from Murray Bridge trees and terrain. 6 figures. Painted December 2009. Painting output has decreased significantly since paternity leave ended and I went back to work at the beginning of January. After 5-odd years of painting 12 figures a week (6 during the weekdays and another 6 at the weekend) I'm trying hard (and struggling) to stick to 7-8 figures a week - the new batch is started on Monday morning and hopefully finished Sunday evening. I think it's important to set some sort of weekly target, if only to give yourself an indication of how many figures you can realistically expect to paint. This means that gaps between posts are likely to lengthen and so I'm hoping to maintain about 2 posts a week by posting pics of stuff I painted over the past couple of years but which, for whatever reason, has remained un-photographed. These items are all AWI, which will help with alternating posts between the AWI and the FCW - this alternate system of posts is what I intend to do going forward. 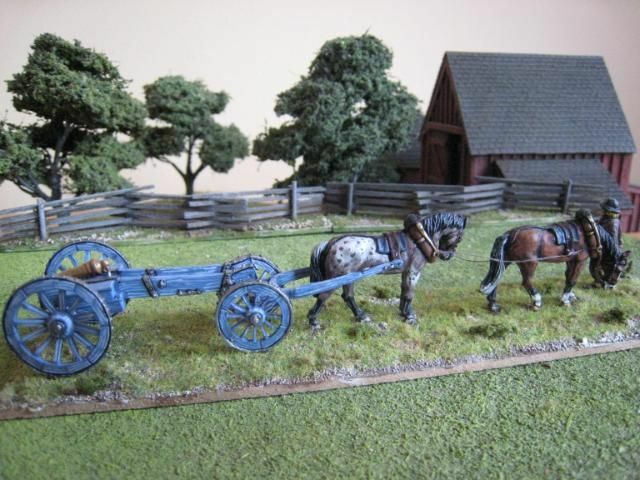 So first up is a Perry Miniatures British 6-pounder limber that I painted in September 2008 for the Long Island game that November. It remained "un-posted" because I had meant to attach tracing to the horses - I only got around to doing so last night. This is a companion to my other limber, here. As I said in that earlier post, I like to find photos of specific horses to work from and to identify particular breeds. Here we have a dapple dun and a golden bay. The dun was painted using the Foundry "Quagmire" palette with one or two extra highlights. The tracing is white cotton with a dark brown ink wash. I recall that the photos I used for reference had tails which were a mix of black and white hair, one with white hair at the top and the other with it at the bottom. I thought this might make an interesting contrast between the two horses. In addition to the regular army and provincial militia, the Isabelino cause could call upon units of urban militia, or "urbanos", which from 1835 were called the "National Guard" and then from 1838 the "National Militia". These units were raised in towns and cities and were mainly used locally to defend their home areas from Carlist incursions. 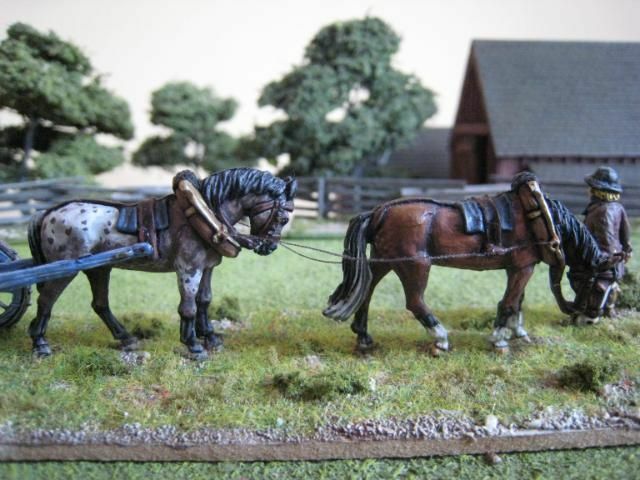 At the beginning of the war some units were used in the field to make up for a lack of regualr army units. National militia also acted as a sort of political police, preventing Carlist support from fermenting and dealing with local trouble-makers. 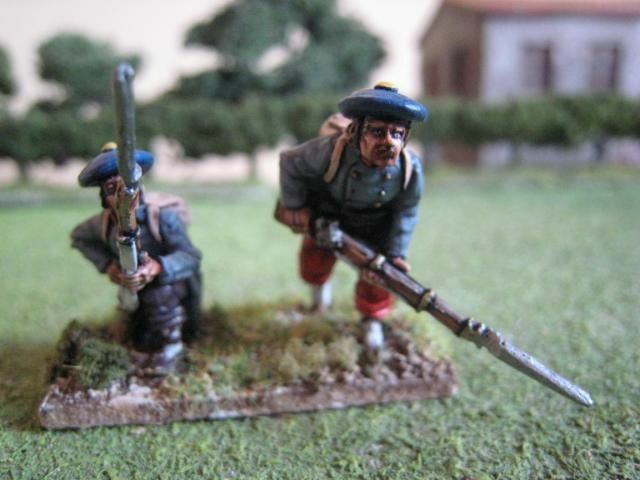 I chose the Zaragoza Militia simply because an Adolfo Ramos flagis available for this unit. The province of Zaragoza (or Saragossa in English) is in north-eastern Spain, part of the old Kingdom of Aragon. Its capital, the city of the same name, is known to modern military history as the victim of a brutal siege by French forces in the Napoleonic wars. The national militia's uniform seems to have been pretty similar to that of regular army line infantry, but with yellow piping and facings and sky-blue trousers. It is also possible that there were local variations. The organisation of companies also seems to have followed the regular army - so with flank and centre companies (unlike the provincial militia, the national militia's flank companies were not detached). 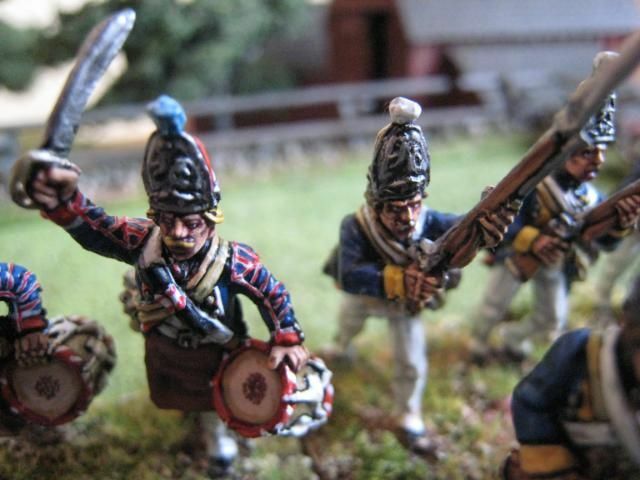 I followed the illustration of the Madrid militia in the Perry/Cairns book and used figures in the older uniform. 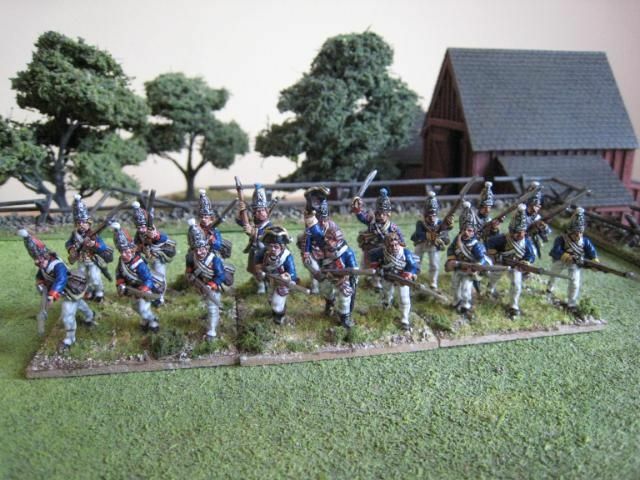 The blue trousers were painted with the Foundry "Bavarian Cornflower Blue 73" palette. 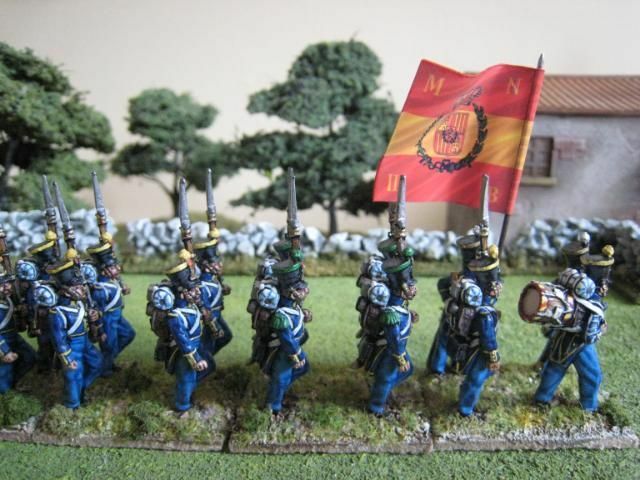 The National militia were the first armed units to carry the red and yellow flag, which was adopted by the army generally and Spain itself in the 1840s. This reflects the militia's status as armed liberal paramilitaries rather than troops descended from the old Bourbon army. As stated above, the national militia tended to see action in the field at times when sufficient regular army units were not available. For that reason I think I only need one national militia unit in my Isabelino army. It can double up as provincial militia if required. This now gives me 8 Isabelino infantry regiments, plus 3 units of BAL. I need to do some light infantry and skirmishers and then turn to the cavalry. 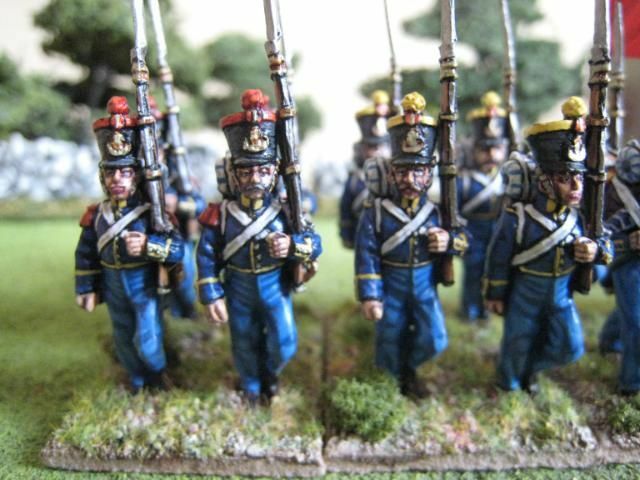 Immediate next FCW plans are to finish a BAL infantry battalion and then either some BAL lancers or more greatcoated infantry. 20 figures. Painted December 2009. Flag by Adolfo Ramos. A happy new year to all readers. Today is the third anniversary of this blog and may I also say a big "thank you" to everyone who reads, comments, and emails - as I know is the case with other bloggers, the interaction that comes from internet activity is very part of the fun and the reason why bloggers do this. I've learnt much from the information people have provided here and it is much appreciated. 2009 was certainly a busy year for many of the bloggers whose sites I visit - new arrivals for Stokes and Dinium as well as myself. I believe it is customary at this stage in the year to do a round up of the year's painting. 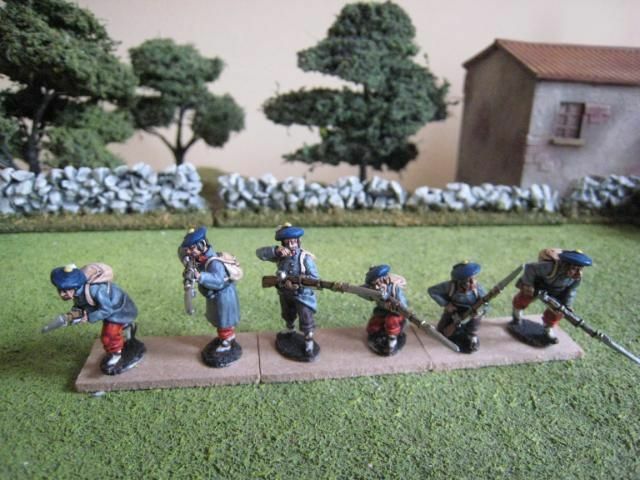 I've been very pleased with how the First Carlist War collection has come along since I started in April. 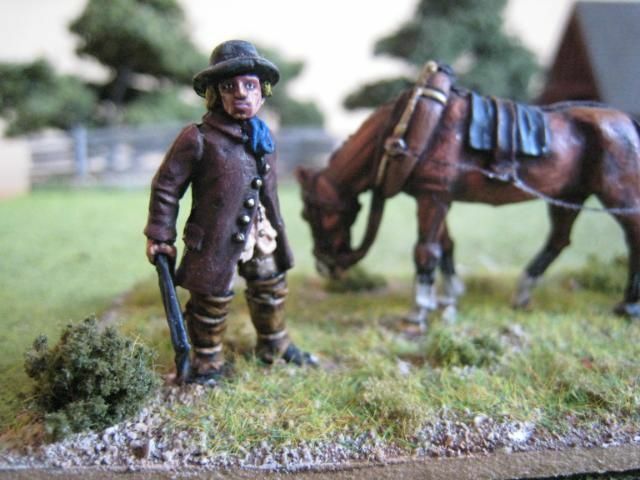 The Sudan faded rather once the FCW kicked in, but I've enjoyed returning to the AWI at various times and working on the English Civil War gave me some useful painting experience in a couple of areas (I still haven't posted the artillery and command stuff I've painted). Next year will bring more of the same, I expect, only in smaller quantities. I suspect there will be more of a focus on AWI, given the forthcoming French and other goodies from Perry and some nice titbits from Eureka. Naps are unlikely to return in the forseeable future, and the First Crusade and ECW will remain projects to turn to as the desire grabs me (which it will). I don't believe in New Year's Resolutions (although I did manage to give up alcohol for a whole 2 weeks several years ago), but cutting down on the leadpile is one I will be taking seriously, given the impact a baby and non-earning wife will have on one's cash-flow. Already the ECW, FCW, First Crusade and Sudan have a "no new figures until all the ones you have are painted" rule in force (which I've managed to stick to), and I may have to do the same with the AWI. 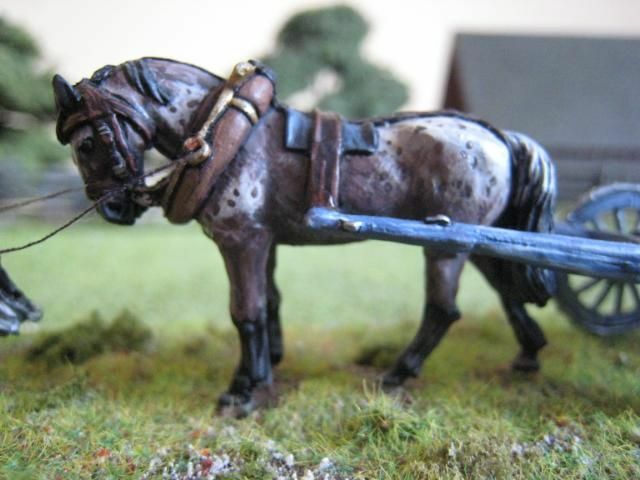 FCW: 218 infantry; 3 guns; 1 mule. 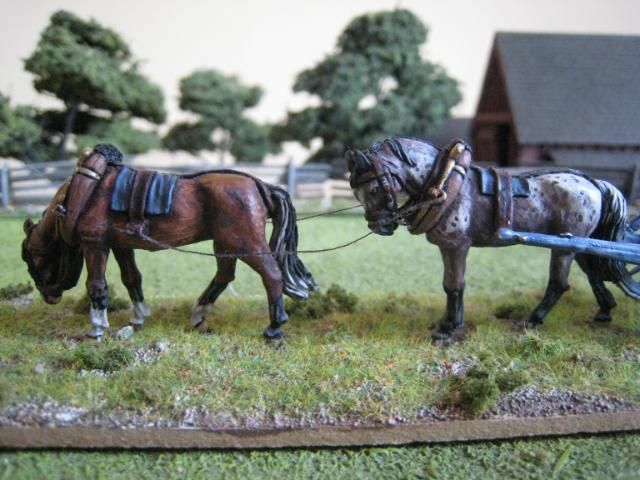 ECW: 90 infantry; 3 cavalry; 2 guns. First Crusade: 24 infantry; 3 cavalry. Counting guns as "1" and cavalry as "2", that gives me 524 pieces. This works out at 10.9 figures per week which is just under my weekly target of 12, but that is perhaps excused by a month-long wedding and honeymoon and a lot of Hugo-time recently. I'm sure next year's tally will be much smaller! 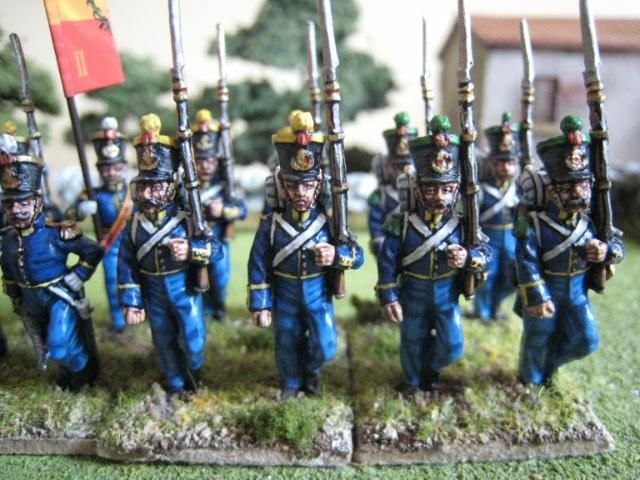 The wip photos show the von Linsing grenadier battalion for the AWI, which is now finished, and the first Carlist troops for the FCW. 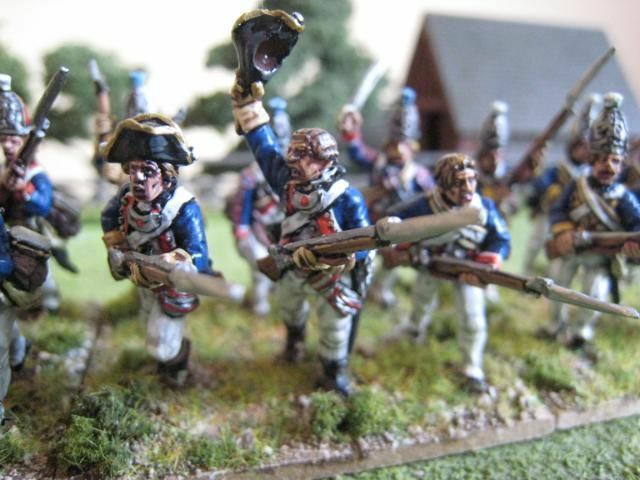 On the workbench at the moment is a third British Auxiliary Legion battalion for the FCW, a Royal Marines rocket troop and some more AWI Hessians.